Building enterprise mobile apps from scratch is becoming more complex. Not only do you have to contend with various OSes and devices, but you also have a high bar for security and compliance. 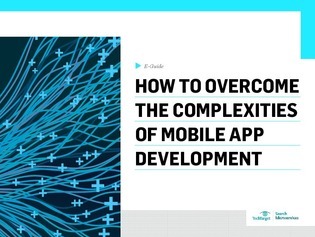 In this expert e-guide, explore how organizations are adapting to the growing complexity of mobile app development with mobile backend as a service (MBaaS) platforms. Find out how to accelerate enterprise mobile app development securely, and discover how to take a hybrid approach to meeting the demand for mobile development skills by balancing in-house and contract developers.